should be barred from entering the nation when necessary, President Tsai Ing-wen (蔡英文) said yesterday. 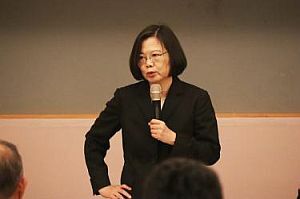 Those who have promoted applying China’s “one country, two systems” framework to Taiwan or have called for China to intimidate Taiwanese should also be barred from entry when necessary, Tsai said after meeting with Ministry of National Defense and Mainland Affairs Council (MAC) officials at a routine national security meeting. The instruction followed the deportation last week of Chinese academic Li Yi (李毅), who was scheduled to speak at a pro-unification seminar held by the Chinese Unity Promotion Party (CUPP).